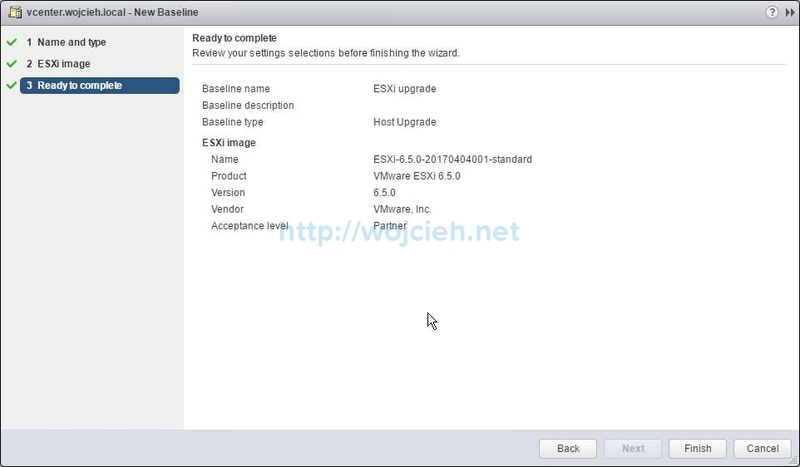 In the last post about upgrading ESXi 6.0 to ESXi 6.5, I showed you How to upgrade ESXi 6.0 to ESXi 6.5 using esxcli and How to upgrade ESXi 6.0 to ESXi 6.5 using Interactive Installer. 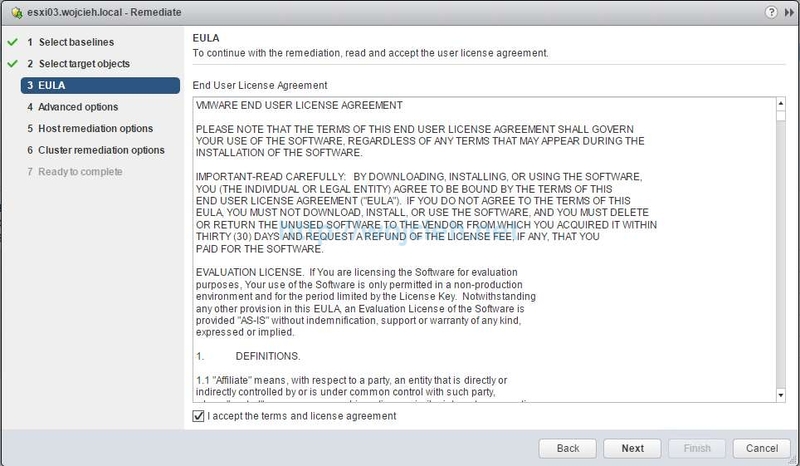 In this post, I will show you how to upgrade ESXi 6.0 to ESXi 6.5 using VMware Update Manager. In my previous post, I showed you the process of Migration of Windows vCenter Server 6.x to vCenter Server 6.5 Appliance. With the release of vSphere 6.5, vCenter Server Appliance finally has built-in Update Manager. This means that in 99% cases Windows Server is no longer needed to manage updates of ESXi and virtual appliances. 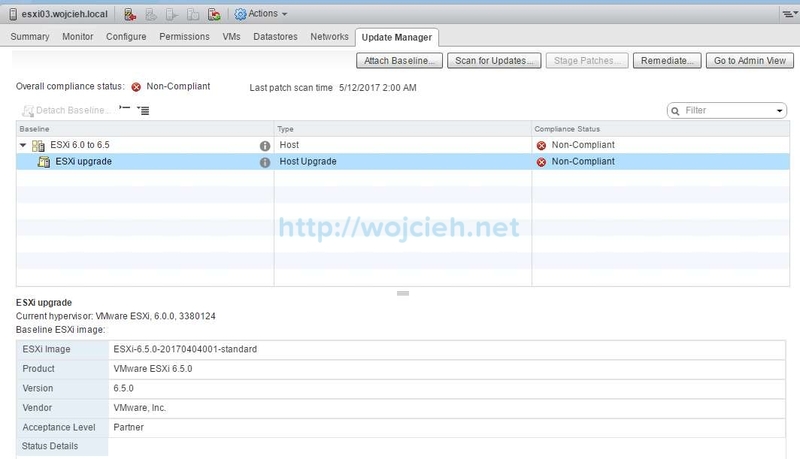 Log in to vSphere Web Client and click Update Manager. 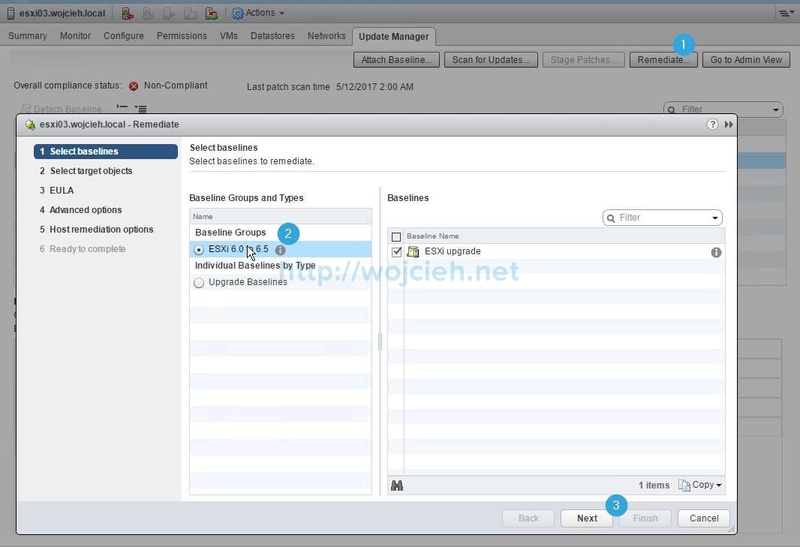 Choose your vCenter Server and click Manage. 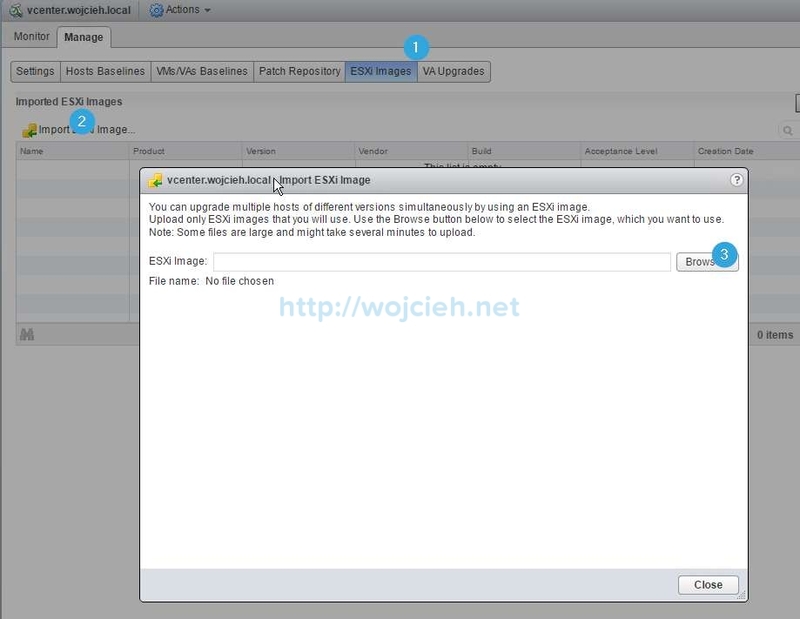 In ESXi Images section click button Import ESXi Image and point to downloaded ESXi ISO. After few moments ISO will be imported to Update Manager. We will create new Baseline and choose Upgrade. Give it a name and select Host Upgrade. 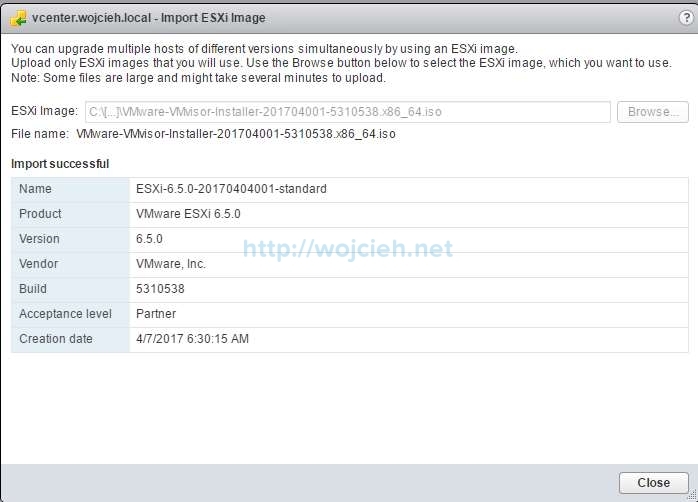 Choose previously uploaded ESXi ISO image and click Next. We just need to click finish to finalize New Baseline creation. 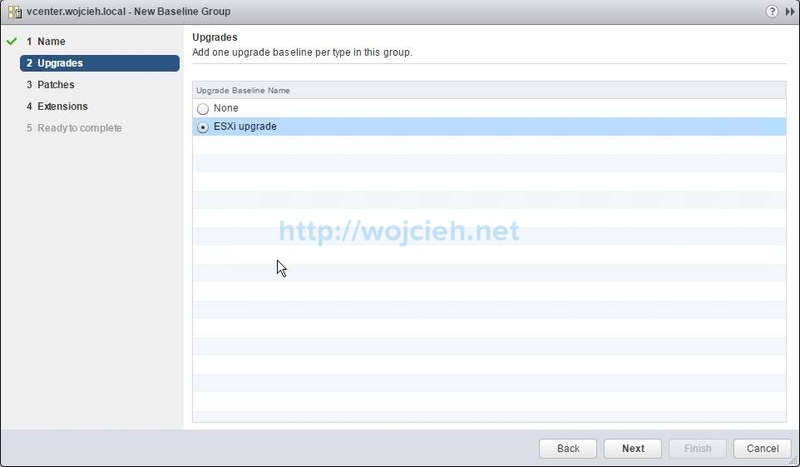 We will create new Baseline Group and attach it to one of the ESXi hosts. Click on New Baseline Group and name it. Now we need to add previously created Baseline. I will skip patching the host. On the extensions section simply click next. Ready to complete screen provides us a short summary of Baseline Group. 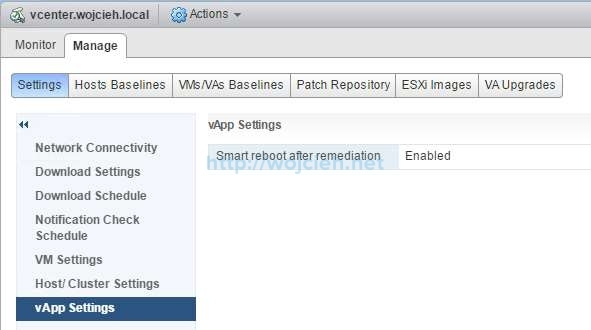 We are prepared to upgrade ESXi 6.0 to ESXi 6.5 using VMware Update Manager. 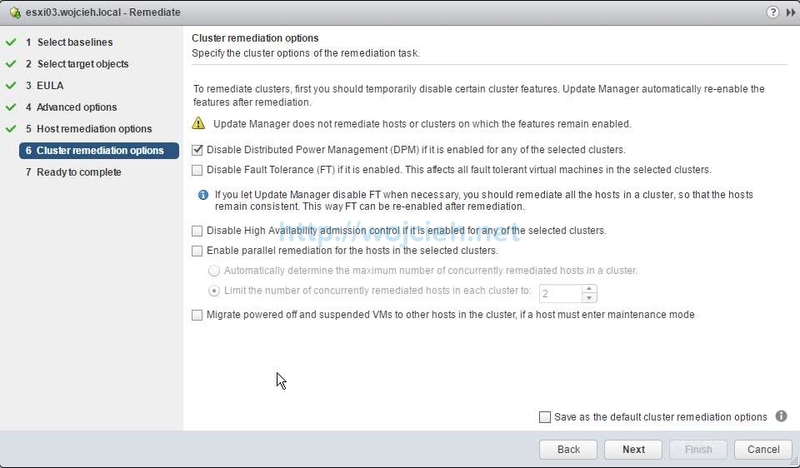 Choose ESXi or Cluster (I will upgrade one ESXi) and click on Update Manager tab. 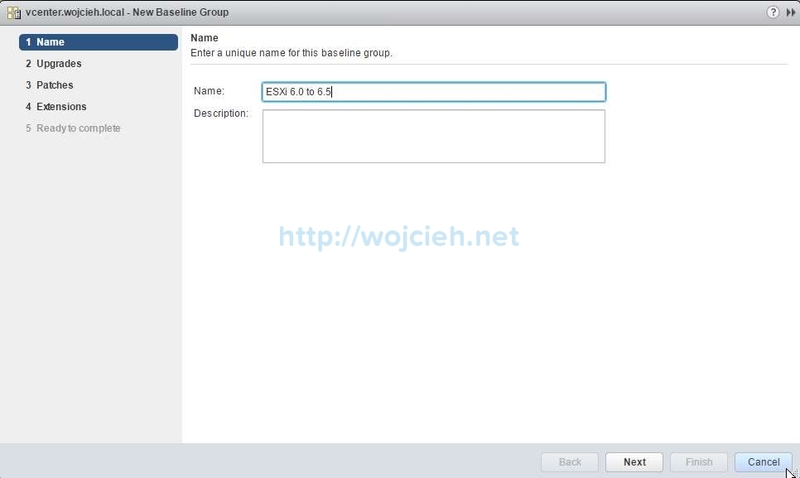 Click Attach Baseline and select ESXi 6.0 to 6.5 Baseline Group. Click San for Updates to find out if a host/hosts is/are compliant or not. In my case, I had to remove NSX 6.2.4 VIBs. After a quick removal of incompatible VIBs (in a production environment you don’t want to do it 🙂 ). 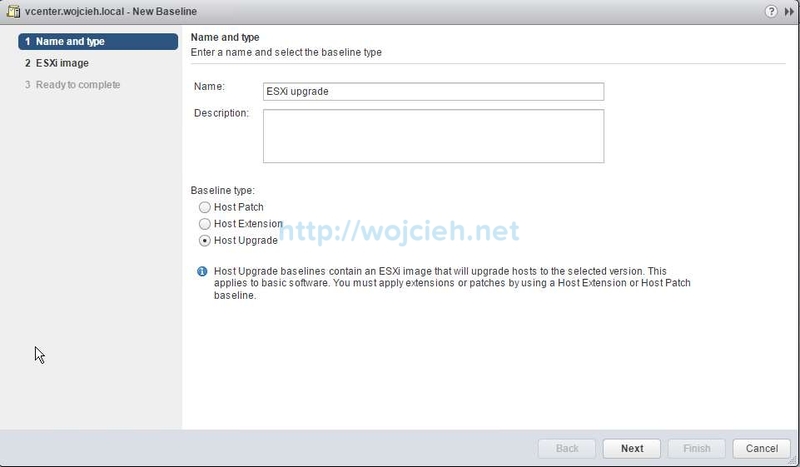 To perform upgrade we will Remediate and attach baseline to ESXi. Since I clicked on single ESXi hosts it is already selected. If you would select cluster all members of the cluster would be listed. We have possibilities to choose from advanced options like scheduling the task or ignore warnings. 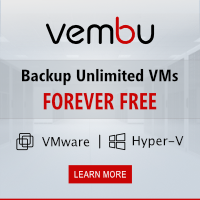 In Host remediation options we can decide if we want to change VM Power state, disable any removable media devices connected to the virtual machines or how many times maintenance mode will run in case of a failure. In next section, we can configure Cluster remediation options. I went with the defaults. 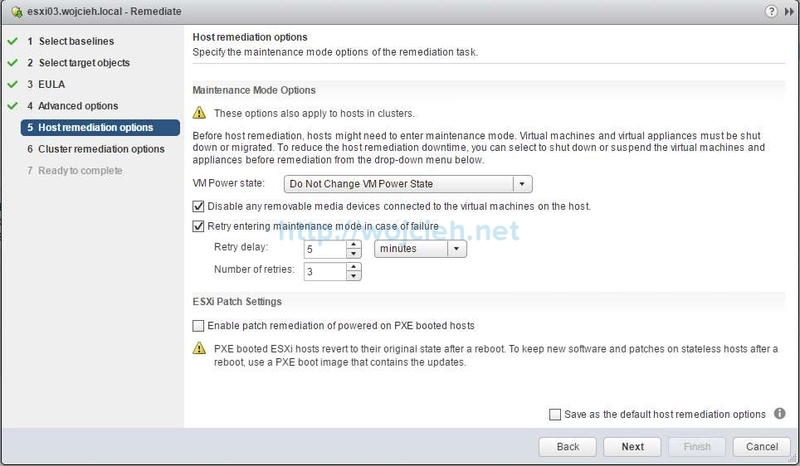 On the Ready to complete page we can review options selected for ESXi upgrade. After few minutes ESXi is upgraded from version 6.0 to version 6.5. VMware Update Manager is very powerful management part of vSphere stack. 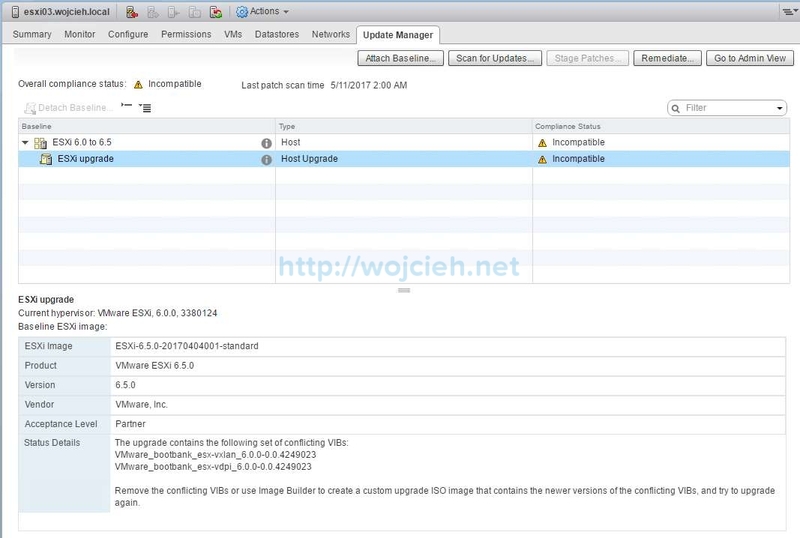 In just a few steps we can update many of ESXi servers without any interruption to running workloads. would you have to update the whole cluster or could you just upgrade host by host if you wanted to be safe and step thru it? like going thru the steps you’ve listed over and over one by one for each host? To answer your question – it depends. If this is test/dev cluster I would I go with more hosts at once. If this is production cluster I would go with a safe approach and go one host by one. It as well depends if you have change management because you have to justify the risk of going more hosts at one than one by one. It also depends on how the cluster is utilized. If utilization is high I will go one by one. 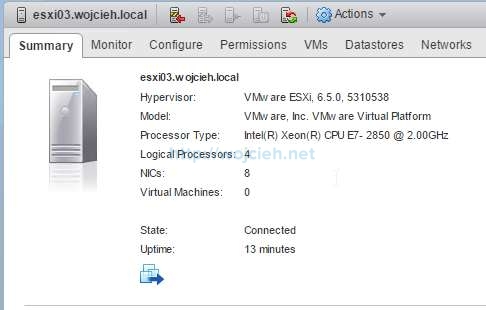 Hello Wojciech, one of my production cluster has only 1 ESXi Host (5.5) and 1 running VM appliance on it. I need to update the host to 6.5. How should I go about that? 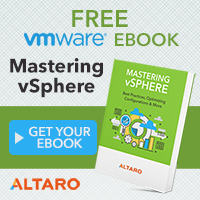 Can I just power off the vm and leave the virtual machine appliance in the host whilst doing the upgrade? Your approach is correct. 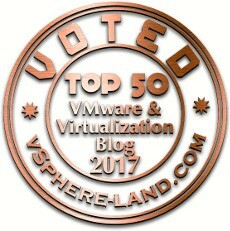 Power off vm, do the upgrade of ESXi and VM will be not touched. If the VM isn’t running on local storage nothing should happen to it. I still would recommend having a backup of that vm. Thanks for the quick reply. But unfortunately the VM is running on the local storage. So I’m a bit unsure if that will or will not affect the VM while doing the upgrade. Depends on the size of the VM I would export it or copy it somewhere else to have a backup. In 99,99% cases, nothing will happen to VM on local datastore.